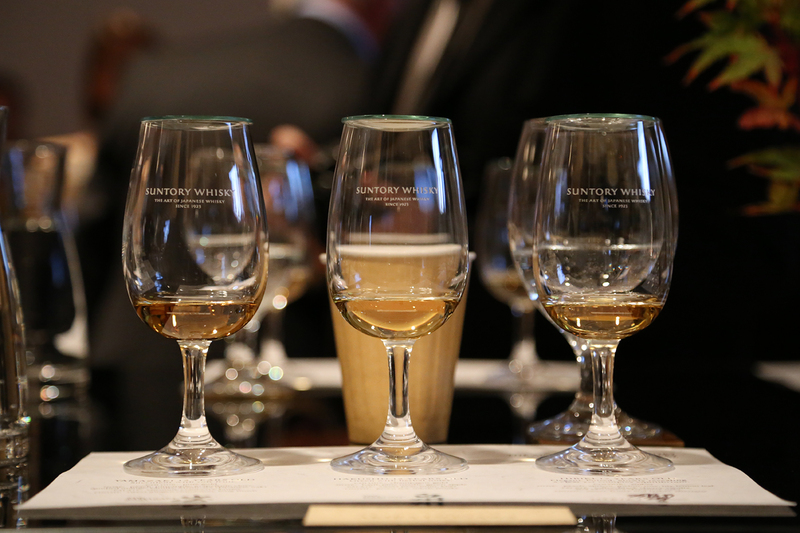 Until now, Suntory products have been fairly thin on the ground in Australia. Sure you’ve been able to track down the odd bottle of Yamazaki 12 year old, or maybe even a Hibiki (if you know where to look), but as far as official imports go, they’ve been fairly non-existent. 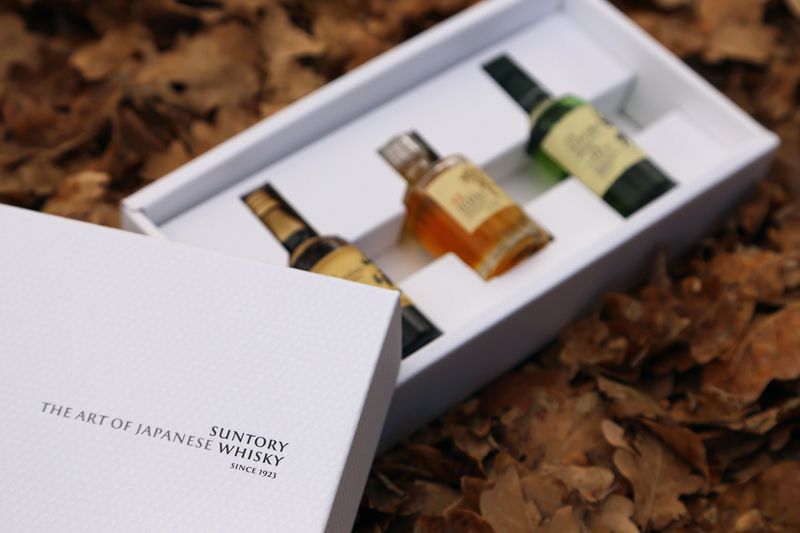 With the recent rise in popularity of whisky – and Japanese whisky specifically – Suntory Australia have started to officially import six expressions, which can now be found in most major liquor stores right throughout the country. For details on the range and pricing, see this recent post. 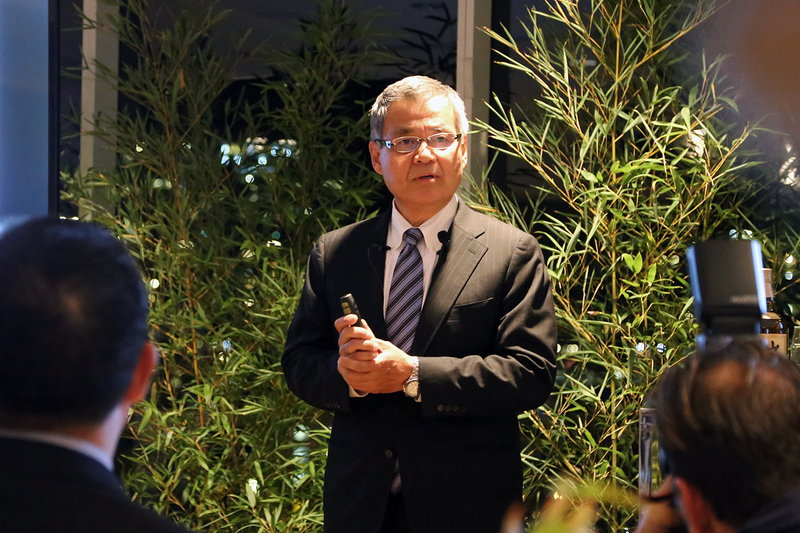 With that decision came a product launch and on a recent Monday night they hosted a rather decadent soiree in Sydney, which unfolded a bit like this. As a general rule, I don’t like Mondays. However, when they involve whisky, and in particular, a rather lavish evening of whisky, excellent food and great company, they all of a sudden become a whole lot better. 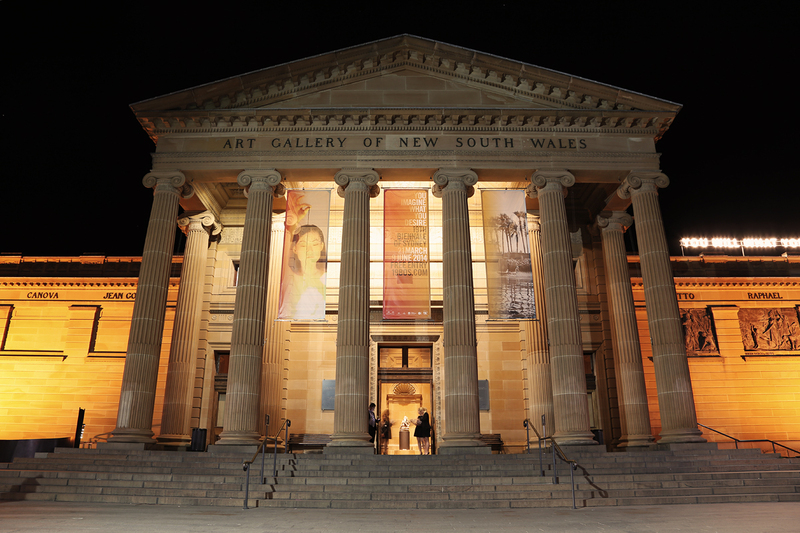 Such was a recent Monday when Suntory Australia officially launched six of their bottlings in to the Australian market, in Sydney, at the Art Gallery of New South Wales. 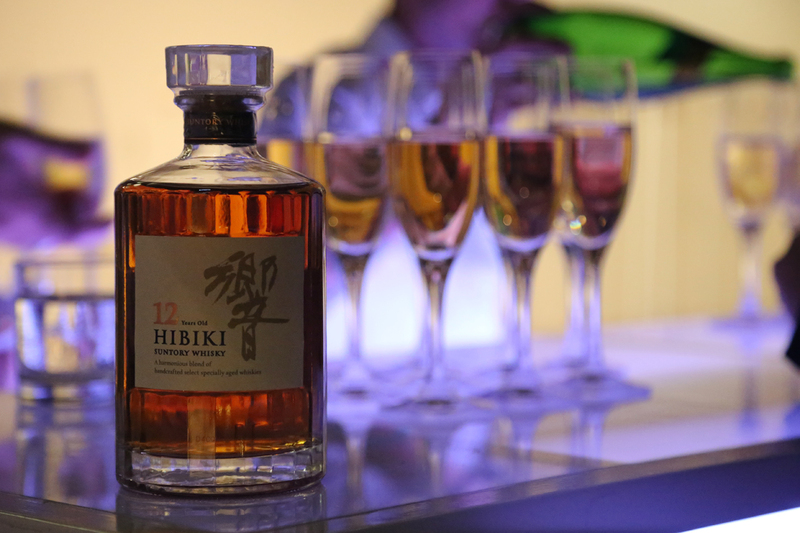 Upon entry, guests were treated to a highball (whisky + soda water) of Hibiki 12 year old and Perrier sparkling water, served simple and tall in a Champagne flute. I’ve had whisky + soda before, but never in this ratio. I can’t say I’ve ever really contemplated diluting a quality whisky to this extent, but it was actually really refreshing. I don’t think it’ll replace a good G&T in summer, but I’ll certainly start to alternate my choice of libation on those warmer days! 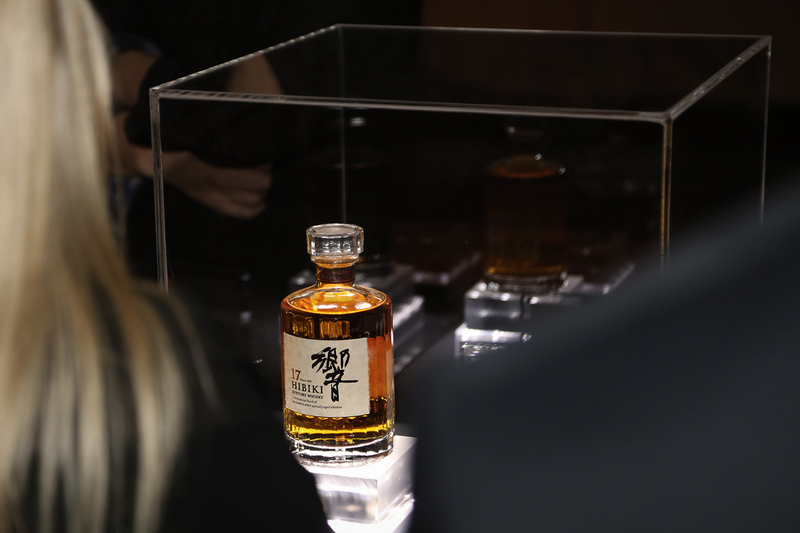 Guests mingled in the main foyer area of the gallery around six illuminated plinths, each housing one of the six Suntory expressions now available locally. 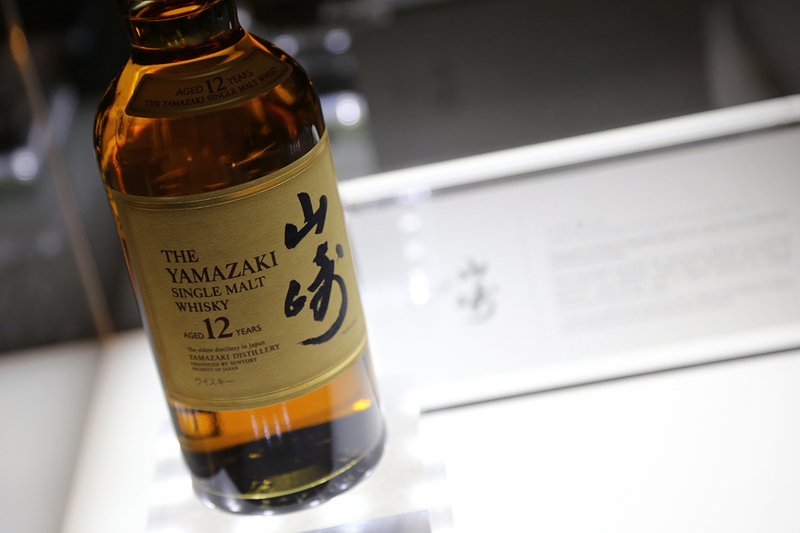 If Suntory were hoping to achieve the whole museum display piece look, then as far as I’m concerned, they nailed it. People stopped and stared, read the placards and took photos. Some seemed to admire them as genuine display pieces (and why wouldn’t you? 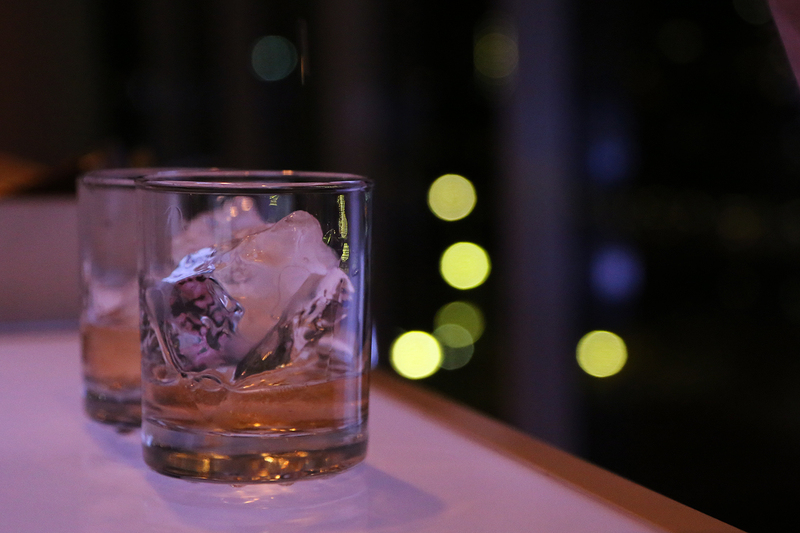 The faceted Hibiki bottle is a work of art). Although it was mere metres away, I must admit that I was enjoying myself so much that I completely failed to notice the tasting room setup toward the back, right up until we were politely ushered in. 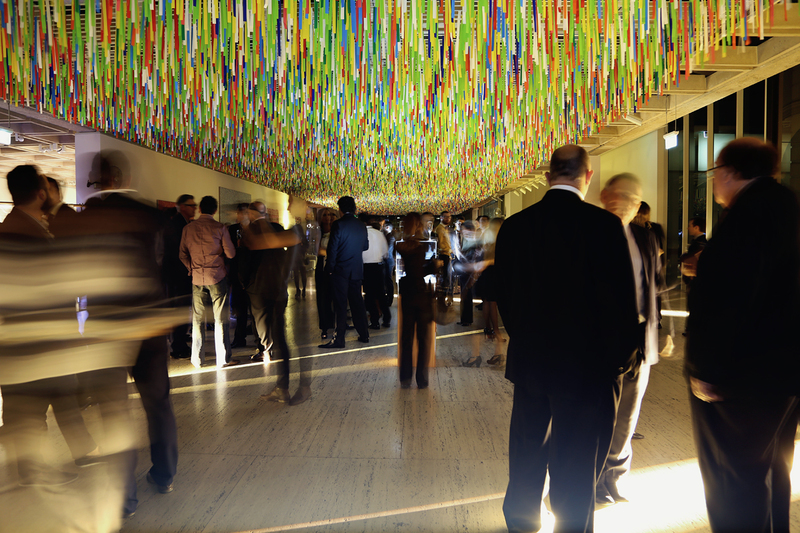 As someone who really appreciates detail, the setup of this space was incredibly visually pleasing. Everything was perfectly aligned, miniature maples adorned the waist-height tables, the glasses were all etched – logos facing forward – and were all adorned with perfectly sized watch-glasses. 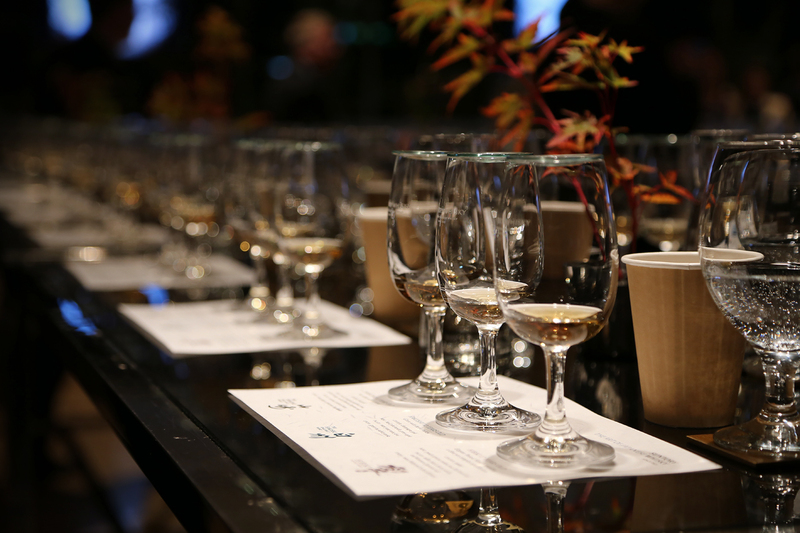 It seemed rather fitting that in a setup of such precision and craftsmanship we were trying Japanese whiskies, created with much the same attention to detail. 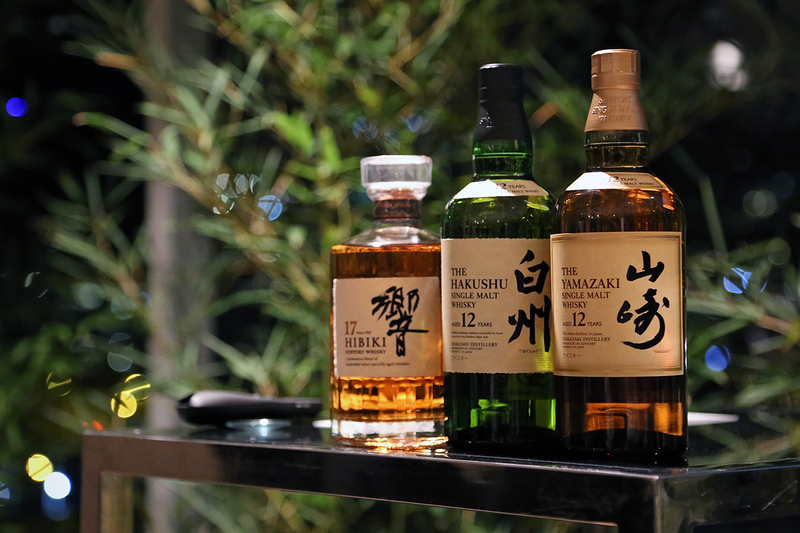 Following a brief introduction, Suntory’s Global Brand Ambassador, Hiroyoshi (Mike) Miyamoto, took us through a tasting of the three core expressions in front of us – Yamazaki, Hakushu and Hibiki – all of the 12 year old variety. Unfortunately, some of the crowd got a bit restless at times, but I suppose that’s to be expected for a group of 150-200. In any case, I absorbed plenty of new info and will write up my thoughts on these three core 12 year old separately. The tasting marked the end of the evening’s formalities. 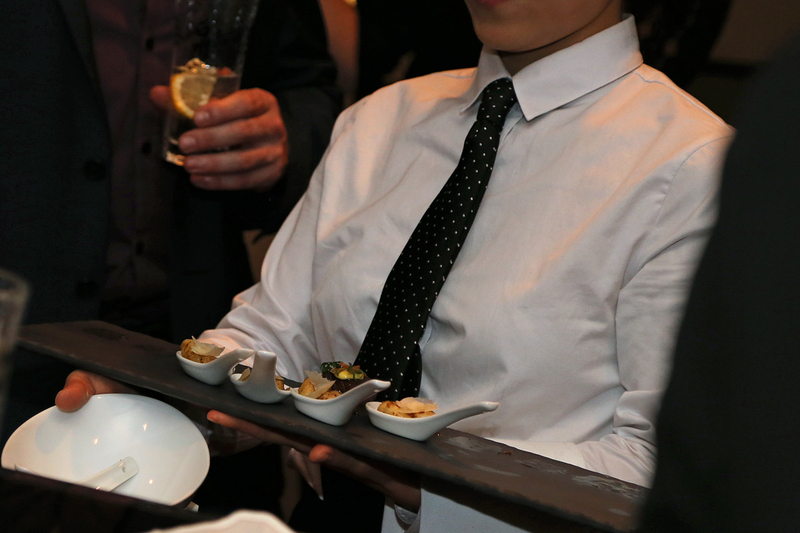 Guests were invited to the adjacent space (which usually holds the Gallery’s main restaurant) to be greeted by whisky and matched canapés, expertly prepared by the Restaurant’s chefs. Think grilled short rib with truffle béarnaise, parmesan and herb gnocchi and seared scallop with passion fruit and vierge dressing – these were seriously tasty. 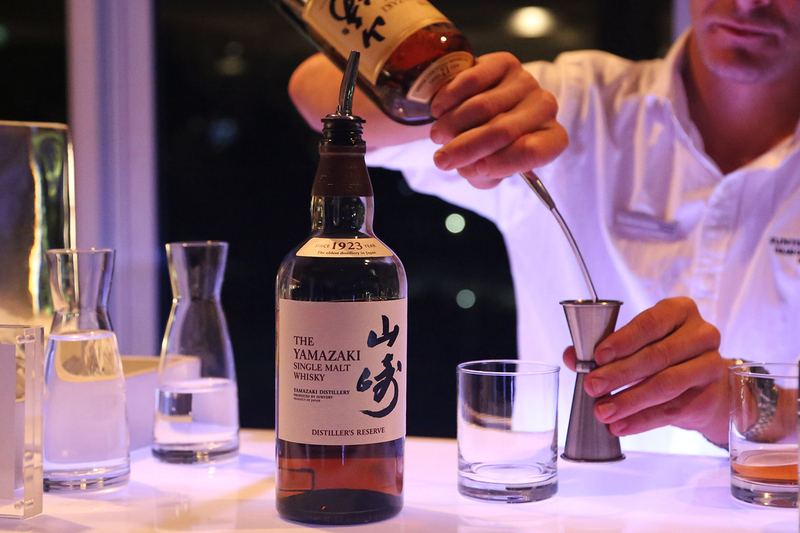 A nightcap wasn’t hard to come by, with three stations spaced around the room, each serving a duo of Yamazaki, Hakushu or Hibiki. Guests were invited to try them neat or on the rock (yes, singular). I say ‘rock’, as each station was equipped with a flawlessly clear block of ice. My initial reaction was that they were for display only (and probably made of plastic). But oh no, they were the real deal and they were being hand-carved and served. I know, I know, it’s a bit crazy to get excited over ice, but these were rather impressive. A DJ kept the beats coming at an ambient level (kudos for not trying to deafen us all on a Monday) and drinks and canapés were still freely flowing as I said my farewells to friends, old and new. A very fitting local introduction for a quality whisky brand steeped in history – just like the rest of the objects within the walls of gallery. My thoughts on Suntory’s core range will follow in a new post shortly.